I generally write for myself – to help me make sense of things. 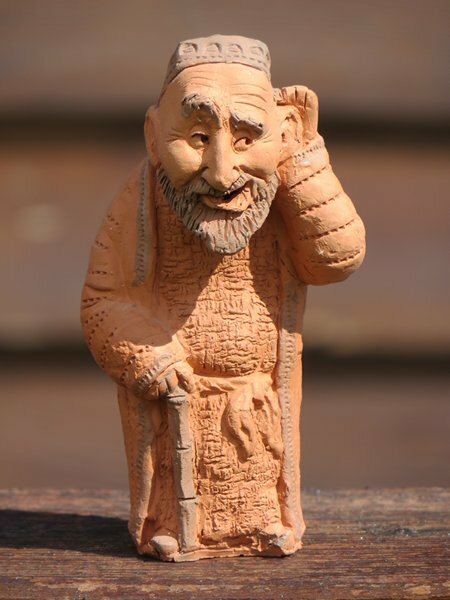 I am not one of these natural story-tellers….who weave tales which seduce listeners. That’s why so many of my texts lie around in an unfinished state – it’s not that I lack the discipline or patience to complete them….I simply don’t have the skill….. But this is a different sort of book – more like a collection of essays you can dip into at any point whenever the mood takes you….not having to bother about the story line or the history of – or connections between – the various characters who figure in the story…. A list of what I consider the most interesting books since 2010 – 50 of them! Change requires both perspiration – and inspiration. And these are inspiring examples…. It is approaching Easter in Romania – Friday 26th to be precise will be Good Friday here…. As a lapsed Christian, this has no particular meaning for me and I have never been able to agree with TS Eliot’s statement that April is “the cruellest month”. That, for me in the mid 1980s in Scotland, was rather November when I was afflicted for 3 consecutive winters by what the scientists then had started to call the S.A.D syndrome (better known to Churchill as his “black dog”). This was a simple reflection of the career quandary which had trapped me as I tried for more than a decade to straddle both an academic and political career – killing my chances, in the process, of success in either…..Students drove me out of academia and I was soon jobless – still with my prominent political position but the time to reflect on what had gone wrong and how I might avoid future bouts of depression. But nowadays this time of the year tends to be marked by 2 rather different but significant and linked events. The good one is the arrival of nettles, lettuce, spring garlic and onion, radish, red pepper et al in the markets here – particularly the Obor one a few tramstops away. Allowing the concocting of nettle stew with mamaliga; and of wonderful salads with the freshly-picked greens with grated carrots, bread crumbs, olives, walnuts, apple vinegar, goat cheese and olive oil…. Far from being a cruel month, April was (in the late 1980s) when I emerged from what was almost like a hibernation. Ever since then, however, I have had great sympathy for those who suffer – the most prominent Brits being Stephen Fry and Alastair Campbell. 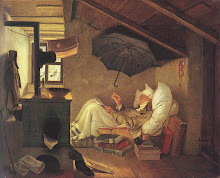 At the time Philip Toynbee was about the only prominent person admitting to the condition (I remember reading his “Part of a Journey – autobiographical notes 1977-79”) although Dorothy Rowe’s Depression – the way out of your prison;(1983) became, deservedly, a best-seller. chapters on the suggested reconnections focus on: a) other people, b) ‘social prescribing’, c) meaningful work, d) meaningful values, e) sympathetic joy and overcoming an addiction to the self, f) acknowledging and overcoming childhood trauma, and g) restoring the future. I thought it would be useful to try to write a blurb for this book – on the basis that it might give me a checklist against which I could check whether the text actually fulfilled its promises – or what I thought the book should cover…..
“This is a book”, I started “about the ways we have tried to think about the economic crisis which has gripped us over the past decade”…..I paused to look at the words….”Hang on! That’s not true” I said to myself…”It’s a book about how I have tried to think about the crisis”. The royal “we” on these occasions tends to creep in unconsciously - perhaps to protect us against accusations of subjectivity, perhaps to add an air of abstraction. I must have forgotten that, when I first compiled this short version a couple of years ago, I had chosen the title quite deliberately to convey the sense that the book would indeed try to strike a more “personal” note or “tone” than is normal for such subjects. I was trying, after all, to gather my thoughts together “as if” I was leaving a letter behind for my children…In such an endeavour, I was following the lead of people like Ernest Callenbach who had left behind such a letter – or Alain Touraine or Yanis Varoufakis who had penned highly personal books inspired by the thought of loved ones…. When you come across an author who holds your interest, you start to ask why others can’t do the same…. It was in 2000 or thereabouts that I first started to feel that the world had taken a wrong turning – a short paper called Guide for the Perplexed captured these thoughts…. The global economic crisis of 2008 just confirmed those initial feelings. It was at this stage I started the blog – using it to record notes on my readings. Many of the books left me confused – unable to reconcile their arguments with the equally convincing ones of other writers on the subject. In many cases the books didn’t even bother to mention the other writers – let alone build on their work…..I therefore started to draft something which might help me understand better but incorporating those posts about the developing critique on our political and intellectual elites. The result, some four years ago, was Dispatches to the next generation – the short version which still lies unfinished. In a following post, I’ll give you a taster for the second part of the little book – which is by way of being what the academics call a “literature review” ie not just a list of books but brief comments which give a sense of what sort of value it adds to the discussion..
As I cast my critical eye over the book as a whole, I realise that although part 1 is strong on judgements, part II is probably too descriptive and insufficiently opinionated! A New Feature for the Blog? I have several times recently referred to the world being overwhelmed with text- let alone images. In despair, I half-seriously suggested we needed to ration at least non-fiction books. I’m surprised that no one has so far turned that back on me to ask why then this blog continues to inflict prose on others……I have an answer….which is that my posts are generally designed to help guide people (a) around complex subjects and (b) toward good text. A Musing Decade put it as simply as I could – namely that few people have the length and breadth of the experience which I can claim to in a variety of roles, countries and disciplines. Both my “voice” and reading notes have developed over a 50 year period which has seen massive social changes. That’s more than 3,000 pages of text – and probably about 20,000 hyperlinks – a veritable Aladdin’s Cave which lies largely untouched. And that’s why I’m now considering what sort of changes I need to make to the blog to raise its profile so that more people can access the material. The change of name is a very minor step. The next is to draw more attention to the E-books…. How could I be suggesting that the Brits are outspoken when the anglo-EU translation guide so clearly suggested differently? And when a new paper I had just come across argued that the very construction of the English language encourages the “hinting” habit which the guide exemplifies? 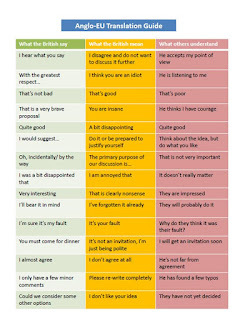 On a scale with “hinting” at one end and “direct” at the other, we can place different national conversational styles. Hinting people often prefer not to say exactly what they mean because they’re concerned with the effect their ideas might have on those they’re talking to. Instead of coming straight to the point (“I don’t think this will work” or “I want to conclude the meeting at 4 o’clock sharp”) hinting people prefer to hint at what they’re trying to say, hoping that the other person will understand without them having to be explicit. The British art of “Politeness” is a classic form of indirectness. We have conventions of politeness that try to make the other person comfortable by not imposing, by giving them a way out, by being friendly etc. Other cultures have more direct styles and value the directness of saying what you mean, (even quite brutally), assuming the other person will appreciate their “honest” approach. Since the British are at the “hinting” end of the scale we can find other more direct conversational styles aggressive, rude, or even obtuse. People from more direct cultures may find the British wishy-washy, inconsistent or even misleading. Hinters can come across as unclear and indecisive, whereas Direct people can come across as pushy, rude or insensitive. An yet everyone recognizes the adversarial nature of the English political culture – nowhere more evident than in the confrontational layout of the House of Commons debating chamber, compared with the semi-circle of the French and German chambers. And continental regimes have a long tradition of coalitions and consensual government which is almost entirely absent from the British. In that respect, however, France is closer to Britain and the French legal system is, of course, notoriously confrontational. No matter how “traditional” the British may appear, they are in fact fierce individualists which might surprise foreigners ….Whereas the Brits have very formal and traditional rules of conduct and etiquette that apply to the first “impersonal” stages of a relationship or more particularly to the opening stages of a negotiation, once a more informal atmosphere has been established, there are no strict rules of conduct. As a French Business Manager put it, “in France we are less formal than the Brits at the start of a relationship, but over time, we don’t tend to become as informal as the British will”. Individualism, however. may become downright stubbornness. Because we do not feel pressured to conform to a general consensus, a Brit will have no trouble saying “No” to any point which other European negotiators argue is for the “common good”. Insularity and the Island Mentality contribute to our willingness to fight point by point to the last. Our European partners may see this as a tough approach in multi party, multi cultural negotiations. Equally we can be seen to be playing the role of the devil’s advocate. Of course, the disadvantage of this “semi-detached” attitude is that we are often underachieve in longer-term joint venture projects. A perfect example of this is the high-speed rail link between the channel tunnel and London. The polite but awkward squad? Britain (no longer “great”) has long been credited with being the first to experience the Industrial Revolution and, if not to invent “democracy”, at least to bring forward the modern version of “liberal democracy”. In that sense Britain inarguably has a distinctive - if not quite “exceptional” - history. But the question I want to explore is the relatively neglected one of what exactly accounts for this “awkwardness” of behaviour – after all, the Brits are equally well known for their politeness. One argument indeed is that it is this very politeness which explains the Perfidious Albion reputation “England” at least (as the Imperial overlord) has. But first, a personal note. In the mid-1970s I was, by virtue of my position in one of Europe’s largest Regions, exposed for the first time to the dynamics and discourse of international gatherings. And I found myself quickly being among the first to try to puncture the rhetoric of particularly my southern European colleagues. I’ll never forget the subsequent semi-ostracization I suffered at a mountain retreat in Sicily as a result of my brutal assault on what I saw as the empty discourse of the participants. In the 1980s, by then more experienced, I was lucky enough to be a member of the British delegation in the Council of Europe – the local government section – and learned to cultivate alliances with my Dutch, French, Belgian and German colleagues……But I realised that the impatient readiness to speak one's mind was a well-known British feature – matched only by that of the Dutch. East Asians and Westerners perceive the world and think about it in very different ways. Westerners are inclined to attend to some focal object, analyzing its attributes and categorizing it in an effort to find out what rules govern its behavior. Rules used include formal logic. Causal attributions tend to focus exclusively on the object and are therefore often mistaken. East Asians are more likely to attend to a broad perceptual and conceptual field, noticing relationships and changes and grouping objects based on family resemblance rather than category membership. Causal attributions emphasize the context. Social factors are likely to be important in directing attention. East Asians live in complex social networks with prescribed role relations. Attention to context is important to effective functioning. 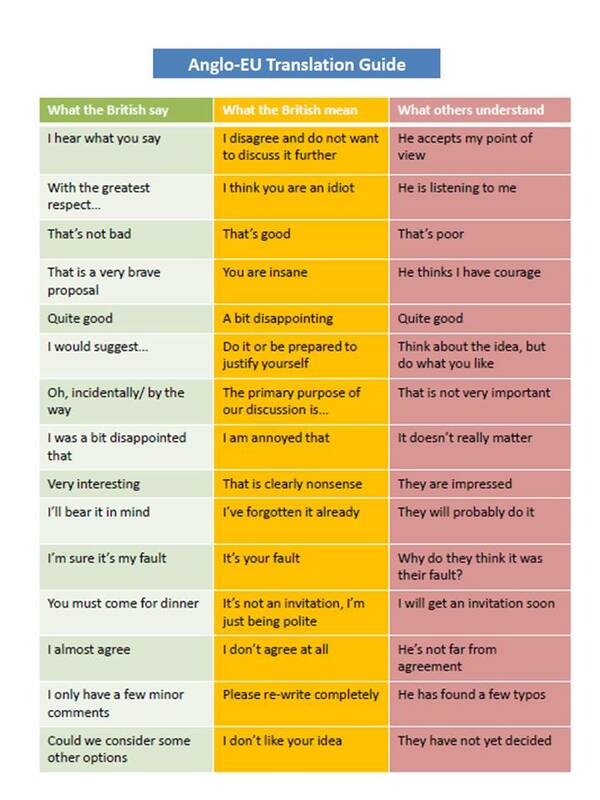 But it’s more recently that many of us came across this devastating Anglo-EU translation guide which takes some common phrases Brits use; how our European partners generally understand them; and what the Brits really mean by them. For example - when we say "very interesting", foreigners think we are impressed. What we are actually thinking is that it's a lot of nonsense! Similarly, when we say "with the greatest respect", we are actually thinking "the man's an idiot" whereas the non-English speaker assumes that he is being listened to. "Incidentally, by the way" actually means "this is the primary purpose of the discussion" – but is thought by the unfortunate foreigner to mean that the issue is of no significance. For those who deal with Brits, the table is essential preparation and, who knows, sharing it with them might open up new friendships. All this is familiar ground……..good for conversation at parties and even in many business schools. But few people bother to go beyond this and try to explore why it is that the Brits behave this way…. It is to that question I will turn in the next post….